Under the framework of the INFORM project, implemented with the support of the Justice Programme (2014-2020) of the European Commission, Law and Internet Foundation, invites you to submit your application for the position of external evaluator. The external evaluator monitors the implementation of the project in order to assess its impact. To this end, he/she shall participate in the project’s events and meetings, shall prepare impact assessment reports and shall provide feedback to the partners. Education and / or experience in the field of Economics, Humanitarians, Administration. Minimum 3 year-experiences in evaluation activities. Has not been the subject of a judgment which has the force of res judicata. At the moment of contracting he/she is not in employment relationships with any of the INFORM partners and has not been in such at least three years prior to concluding the external evaluation contract. 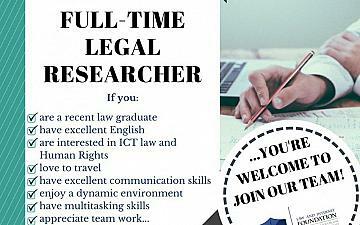 If you are interested in the position, please submit your application on the following email address office@netlaw.bg no later than 23.11.2018.